Up in Troy, NY on the campus of Renesselaer Polytechnic Institute, a state-of-the-art performance facility is about to officially open and the folks up there have planned some really exciting stuff*. The venue is called EMPAC - experimental media & performance art center. They're throwing three weekends of free performances starting in October which yours truly hopes to go and see. The Experimental Media and Performing Arts Center (EMPAC) is a place and a program where the arts, technology and science will challenge and transform each other. 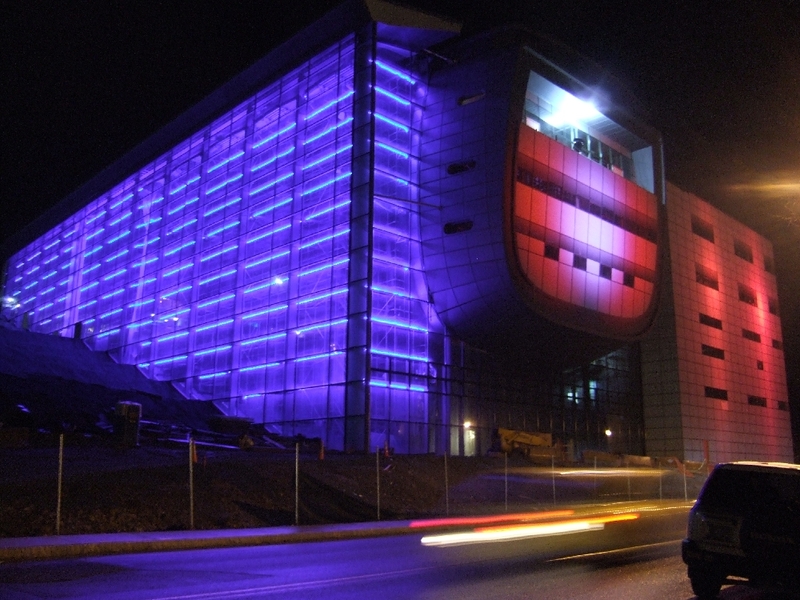 Founded by Rensselaer Polytechnic Institute, the nation’s oldest technological university, EMPAC draws strength from being part of a great research university. It will offer artists, visiting scholars, researchers, engineers, designers, and audiences opportunities that are available nowhere else under a single roof, providing unsurpassed facilities for creative exploration as well as for research in fields ranging from visualization to immersive environments to large-scale interactive simulations. EMPAC operates nationally and internationally, attracting creators from around the world, and sending new artworks and innovative ideas onto the global stage. Rensselaer is the nation’s oldest technological university, offering degrees in engineering, the sciences, information technology, architecture, the humanities and social sciences. It is pre-eminent in research into biotechnology, nanotechnology, IT, and the media arts and technology. In addition to its MFA program, RPI offers bachelor degrees in Electronic Arts, and in Electronic Media, Arts, and Communication – one of the first undergraduate programs of its kind in the United States. As a facility, the new 220,000 square-foot center is like no other, boasting unrivaled presentation and production capabilities: a 1200-seat concert hall designed to the highest acoustical standards; an intimate 400-seat theater; and two highly flexible studio spaces, configurable as traditional black-box theaters or as fully immersive environments. Linked to a massive supercomputer, EMPAC’s potential for art and science spans the physical and virtual worlds and the spaces in between. The Wooster Group's THERE IS STILL TIME.. BROTHER, a commission for an installation that consists of an interactive projection for a 360° screen. Verdensteatret's LOUDER, a collaborative performance installation featuring loudspeakers, shadow puppets, video landscapes, and a huge mechanical spider, activated by actor-musicians. Elevator Repair Service's GATZ, a six-hour performance marathon of a verbatim reading of F. Scott Fitzgerald's The Great Gatbsy. 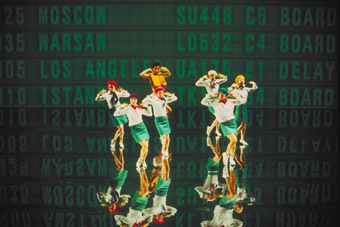 dumb type's VOYAGE, a multimedia performance which examines the uncertainty and dislocation of the modern world through a combination of intense sound, movement, text and projected images.